Each year the Faculty of Sports and Exercise Medicine, based in the Royal College of Surgeons holds a scientific Meeting. This theme for this year’s conference is The Female Athlete and it ran from Thursday the 15th to Sat 17th of September. 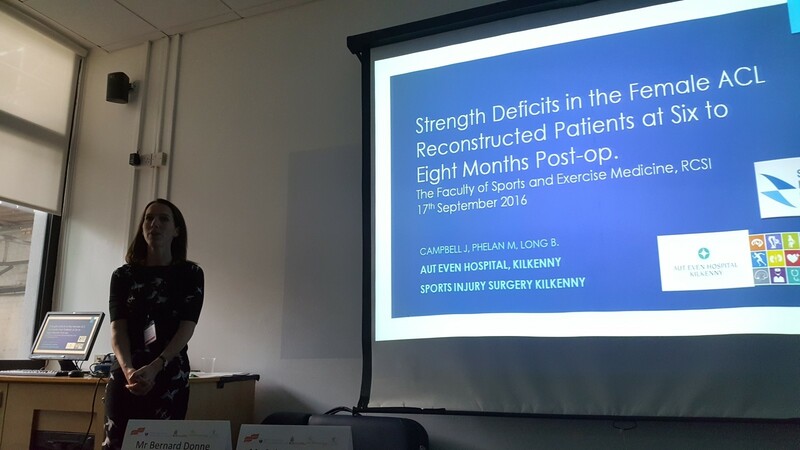 This year Jane Campbell is presenting isokinetic data from Mr Breandán Long’s female patients who had an ACL reconstruction in Aut Even hospital. 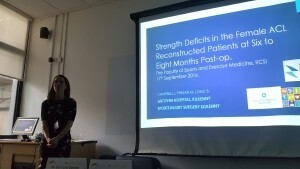 The title of their study is “Strength deficits in the female anterior cruciate ligament reconstructed patients at six to eight Months post op”. Both Breandán Long and Jane Campbell have a keen interest in Research. Breandán Long has a specialist interest in sports injuries, anterior cruciate ligament reconstruction of the knee and rotator cuff repair of the shoulder. Jane Campbell has a Masters of Clinical research and has been working in the area of Orthopaedic research for the past 9 years.